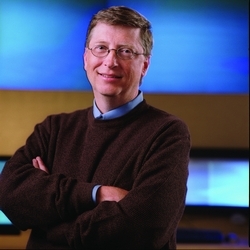 The Secret Mission of Bill Gates? Times on Line - SOME of America’s leading billionaires have met secretly to consider how their wealth could be used to slow the growth of the world’s population and speed up improvements in health and education. The philanthropists who attended a summit convened on the initiative of Bill Gates, the Microsoft co-founder, discussed joining forces to overcome political and religious obstacles to change. Described as the Good Club by one insider it included David Rockefeller Jr, the patriarch of America’s wealthiest dynasty, Warren Buffett and George Soros, the financiers, Michael Bloomberg, the mayor of New York, and the media moguls Ted Turner and Oprah Winfrey. These members, along with Gates, have given away more than £45 billion since 1996 to causes ranging from health programmes in developing countries to ghetto schools nearer to home. Stacy Palmer, editor of the Chronicle of Philanthropy, said the summit was unprecedented. “We only learnt about it afterwards, by accident. Normally these people are happy to talk good causes, but this is different – maybe because they don’t want to be seen as a global cabal,” he said. Some details were emerging this weekend, however. The billionaires were each given 15 minutes to present their favourite cause. Over dinner they discussed how they might settle on an “umbrella cause” that could harness their interests. The issues debated included reforming the supervision of overseas aid spending to setting up rural schools and water systems in developing countries. Taking their cue from Gates they agreed that overpopulation was a priority. This could result in a challenge to some Third World politicians who believe contraception and female education weaken traditional values. Gates, 53, who is giving away most of his fortune, argued that healthier families, freed from malaria and extreme poverty, would change their habits and have fewer children within half a generation. At a conference in Long Beach, California, last February, he had made similar points. “Official projections say the world’s population will peak at 9.3 billion [up from 6.6 billion today] but with charitable initiatives, such as better reproductive healthcare, we think we can cap that at 8.3 billion,” Gates said then.